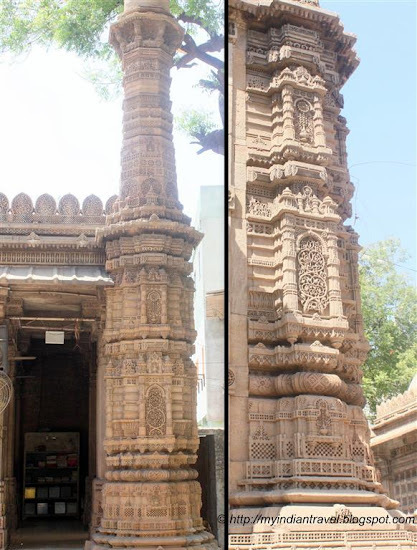 Rani Sipri's Mosque located in the old area of Ahmadabad is one of the ancient monuments that is known for its elegance. the construction of this medieval mosque was commissioned in 1514 by Queen Sipri the wife of Mahmud Begada herself. It is also known as Masjid-e-Nagina (Jewel of a mosque) because of its elegant proportions and slender minarets. This mosque even though small in size it impresses all with the intricate cravings on its walls. The artistic work in the mosque are a reflection of the beautiful craftsmanship of the bygone era. The slender and ornate minarets of this magnificent mosque are the major attraction. I am amazed at the carvings and how long it must have taken one to carve them. Interesting architecture for a mosque. Glad to know about this. The mosque building is so different from the ones in my country. Have a great day! Although not as large as some other mosques or temples that you have visited the carvings here are amazing, thank you for sharing your visit with us on Mosaic Monday today. Oh those artistic relief! When will I see you India! Lovely photo's of something in a place I only know from tv-news. Such intricate carving must have taken a long time to create. Intricate craftsmanship does seem like a trademark of a bygone era ... I am so glad to see it preserved and honored! What an amazing temple - such magnificent stonework. The carvings on such an old and tall structure are amazing. intricate is all i can say also. Pretty amazing. Such a beautiful building. Way back when things were built to last. The detail in the construction is amazing!